This is a true oddity, animation from 1921 called "The Centaurs" which is quite creepy and odd. Winsor McCay was a cartoonist in the early part of the century, around the time that Bud Fisher was making "Mutt and Jeff" a national phenomenon. McCay beat Fisher to the big screen, getting his "Gertie the Dinosaur" animation film up in 1914 while Fisher did not get his first Mutt and Jeff film produced until two years later. Advertising for McCay's animated films called him the "the originator and inventor of Animated Cartoons," which wasn't quite true but was close enough for government work. Almost all films from those days are lost due to the degradation over time of film stock and destructive fires caused by that same disintegrating film. Only a fragment survives of this animated film which looks quite interesting and advanced for its day, "The Centaurs." It was among the last of McCay's ten animated films and may never have been shown to audiences anyway. That may have been a good thing, too, considering how weird it is. He used a form of rotoscoping to create these scenes. In some ways, these fragments look more like a demonstration reel for a projected film, demonstrating techniques that would be used in the later movie itself, rather than the finished product itself. Perhaps he put this together for financing purposes. McCay discontinued his films around this time due to pressure from his primary employer, William Randolph Hearst, and the fact that his films weren't making him all that much money anyway. 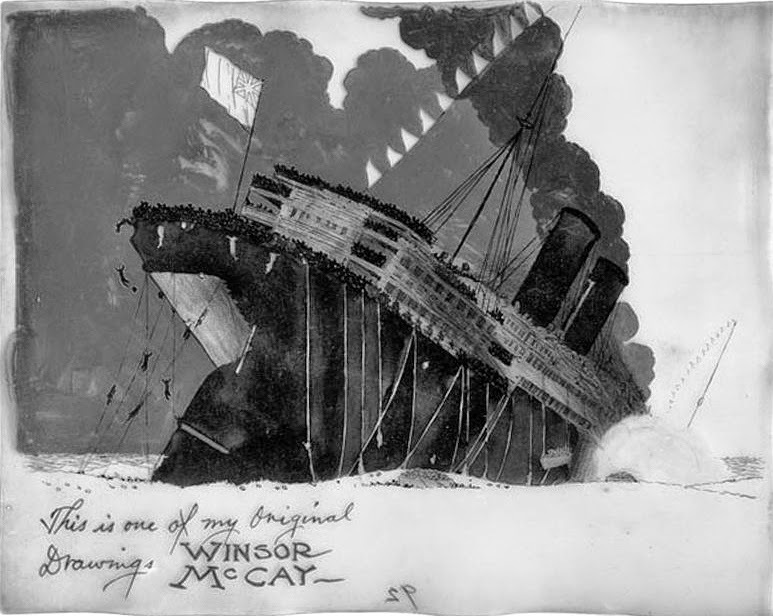 Still, McCay was at the cutting edge of animation of his time, pioneering layering and the use of cels themselves, processes invented while he was making films. His very first film in 1911, "Little Nemo," was a combination of animation and live action, an art form that has recently experienced a huge resurgence in popularity. He also was the first to color in his frames, introducing true color to the cinema. The fact that he worked in vaudeville and showed his films there helped him to develop audience-friendly techniques. It was largely only a matter of timing and opportunity that gave Walt Disney a chance to become a world-famous film-maker and consigned Winsor McCay to utter obscurity. The only surviving fragment of Winsor McCay’s now lost The Centaurs, produced in 1921 by Rialto Productions. The animation is notable for it’s particular quality of line and movement way ahead of its time (20 years before Disney would reach such heights with Fantasia) and for a strange little moment when one of the centaurs strikes down a bird with a stone for seemingly no reason. McCay is best known today for his Little Nemo in Slumberland comic strip and for creating, arguably, the first true character in animation, Gertie the Dinosaur.